Most children want to dress up for Halloween, but for those confined to wheelchairs, it isn’t always that simple. Ryan Weimer understands that concept better than most. When his oldest son, Keaton, was 3 years old, he told his dad he wanted to be a pirate for Halloween. Instead of simply dressing him up, Weimer spent months building Keaton — who lives with muscular dystrophy — a pirate ship made of wood, tablecloth sails and specially-crafted cannons, all fitted to his wheelchair. Keaton was ecstatic — and his dad never forgot the feeling. "When you know that you have few memories to make with your kids, you want to make priceless ones," Weimer told NBC News, "and epic ones." His second son, Bryce, also lives with muscular dystrophy. 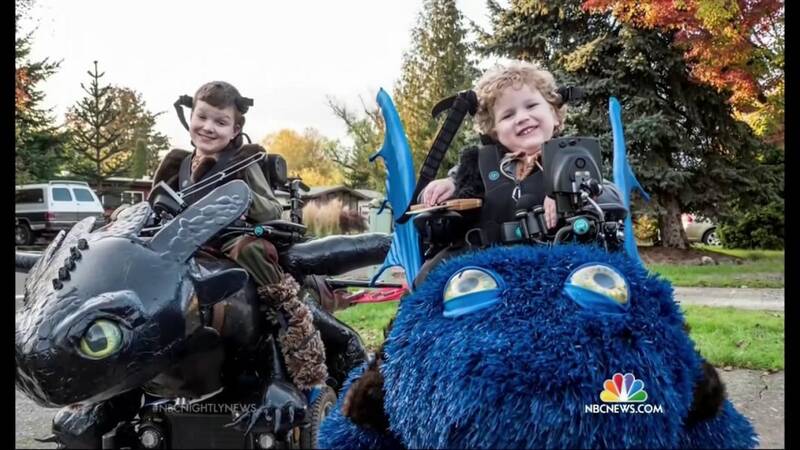 Over the years, their wheelchair costumes have gotten more elaborate and attracted more attention. And this year, the Weimer family project became a hugely successful non-profit, called Magic Wheelchair. Volunteers from around the country donated their time, talents and resources to create dream costumes for eight lucky children — six from Weimer’s home state of Oregon and two from Georgia. "When we have challenges and trials and hard times, those are the things that define us," Weimer said. "It doesn’t' matter your circumstances, you can still make beautiful things ... and it's great to see other people get behind that."